Vacation is all about enjoying some lazy time with family and friends, and there is no better place to relax in the Smokies than LAZY DAYZ LODGE! This 4 bedroom 3 bath home has room for up to 11 guests to spread out on 3 levels of luxury mountain living. Conveniently located in the Woodridge Village in Pigeon Forge, it is an easy drive with no mountain roads, putting you close to the heart of shopping and fun in Pigeon Forge. 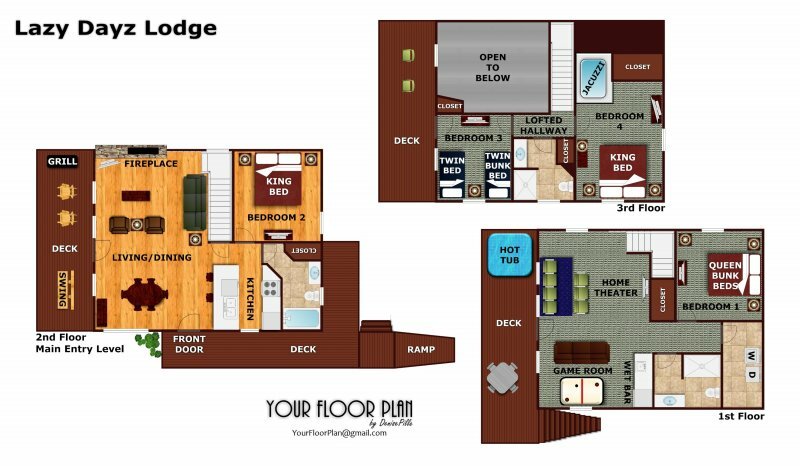 Inside there are 2 KING bedrooms and 2 bunk rooms making LAZY DAYZ LODGE perfect for hosting large, or even multiple families vacationing together. A vaulted great room with stone fireplace opens to covered full length back porch with dinette, grill, and rocking chairs. Downstairs you can mix a drink at the minibar, compete in an air hockey tournament, or kick back in the theater style seats to watch your favorite movie in the home theater! Start enjoying some lazy time with the ones you love, & plan your stay at LAZY DAYZ LODGE today! We have a wonderful time . The cabin was very clean. Lots of room for everyone. We will be stay be at this cabin again. Kingsize bed off of kitchen where my husband and I slept was soft and rolled into a hole. It was miserable sleeping for 3 nights. I have back issues and need a firm bed and this was not it. This is the 3nd year in a row that we have chosen this specific cabin. We will be back each year! My sister passed away last February. I knew that Christmas at her house would not be a pleasant event this year so I decided to take my two nephews and their wives and my great niece and nephew to the mountains. I was a bit nervous since I had not seen ourcabin. We had a wonderful time and found that we had everything we needed. We look forward to returning in the future. Thank you and Happy New Year. Cabin was absolutely beautiful, peaceful and very accomodating for us all. Will definitely be staying again.